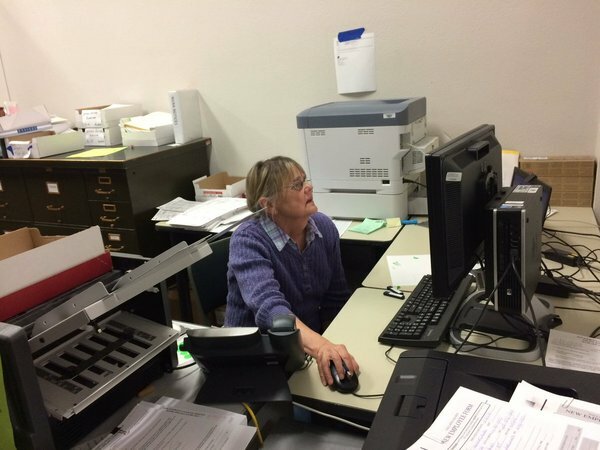 Petroleum County has completed counting. 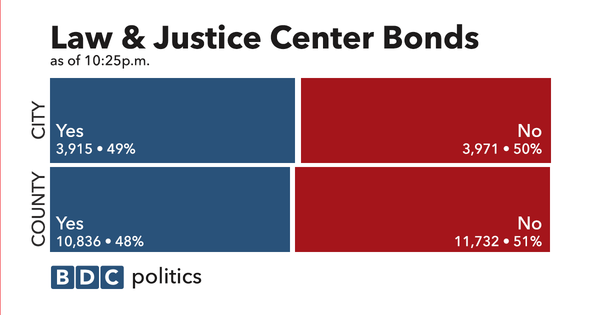 The city law and justice center bond is in a dead heat: 3915 YES to 3971 NO. 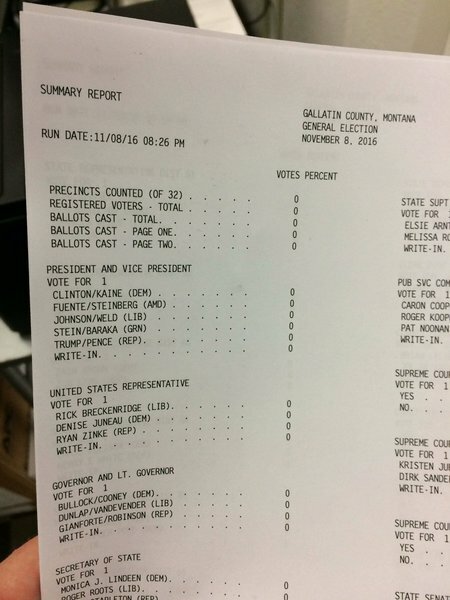 Montana's electoral votes have already been called by the major news outlets as going to Trump, but in Gallatin County it's neck and neck so far: 10,245 for Clinton and 10,279 for Trump. Voters in Gallatin County are just three votes apart so far on the U.S. House race. Denise Juneau sits at 11,213 votes to Zinke's 11,210. Bullock is leading Gianforte by a significant margin in Gallatin County: 12,881 to 9,696 so far. In the race for secretary of state, Corey Stapleton leads Monica Lindeen 11,440 to 10,448 after the first report. At this hour, Dirk Sandefur leads Kristen Juras in the race for Montana Supreme Court Justice 11,134 to 9,131. The local results we have so far are based on 23,455 ballots counted. 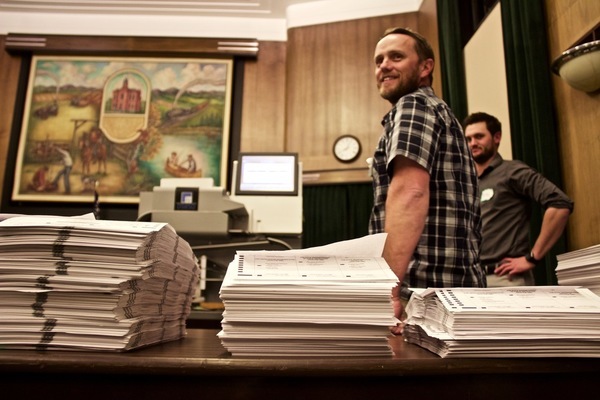 In 2012, for comparison, 48,664 votes were cast in Gallatin County. Statewide voter turnout sits at 27.93 percent currently. 193,467 out of 692,763 registered voters have cast their ballots so far. 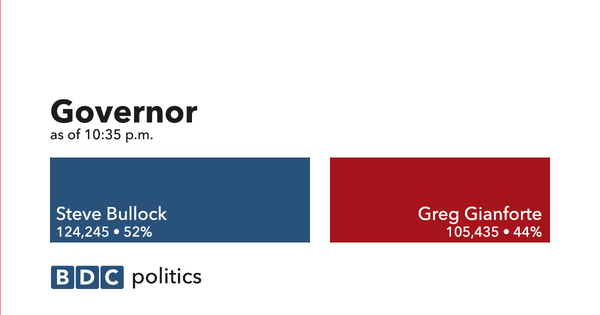 Democrat Steve Bullock is holding on to a 12 percent lead over Republican Greg Gianforte with 191,340 votes in so far. That's 29 out of 686 precincts fully reported statewide (roughly half of all precincts partially reported). In the U.S. House race for Montana, incumbent Ryan Zinke has a 10-point lead over challenger Denise Juneau with 196,819 votes counted. Of note: Gianforte is losing by about the same margin Zinke is winning. Judith basin and Chouteau counties have completed their counts. Still no additional results out of Gallatin County and no indication of when we might get them.